ALGORITHMIC BIPOLARITY & PUBLIC POETRICS ARE TWO RESEARCH PROJECTS ON POPULAR AUTOMATISMS THAT USE AND MISUSE THE "LINGUISTIC INQUIRY WORD COUNT" (LIWC) PROGRAM, WHICH ANALYSES DIFFERENT ASPECTS OF WRITTEN HUMAN LANGUAGE. THIS SOFTWARE HAS ALSO BEEN MISUSED BY PLATFORMS SUCH AS FACEBOOK, WITH THE PURPOSE OF QUANTIFYING THE EMOTIONAL STATES (BOTH POSITIVE AND NEGATIVE) EXPRESSED IN THE PROFILES OF ITS USERS. 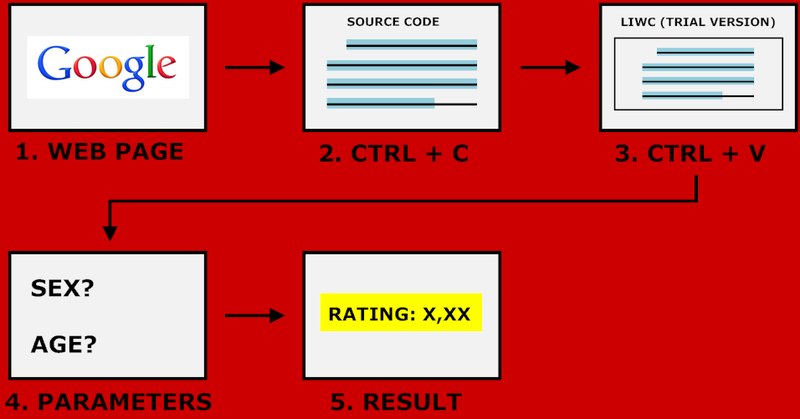 ALGORITHMIC BIPOLARITY REVEALS THE POSITIVE AND NEGATIVE EMOTIONAL RATINGS OF THE SOURCE CODE OF SELECTED WEB PAGES. INSTEAD OF INTERPRETING HUMAN LANGUAGE, THE LIWC SOFTWARE IS FORCED IN THIS CASE TO INTERPRET THE IMPLICIT EMOTIONS IN COMPUTER CODE. THUS, THIS RESEARCH PROJECT TRIES TO DETERMINE THE EXTENT TO WHICH COMPUTER CODE EXPRESSES INTRINSIC EMOTIONAL STATES, WITH THE AIM OF ADVOCATING FOR THE INCLUSION OF MACHINE EMOTIONS AS A SEMI-AUTONOMOUS DIMENSION OF THE SOCIAL BODY. * ENJOY BIPOLARITY, BABY.